After Consumer Reports called the 2013 ILX a "tarted up Civic," Acura responds by offering a host of new standard features in the 2014 ILX, which hit showrooms this week. The Acura ILX sits at a mid-point between the larger TSX and the smaller, sportier ZDX and as the middle child of the Acura lineup, it sometimes gets neglected when product refreshes happen. 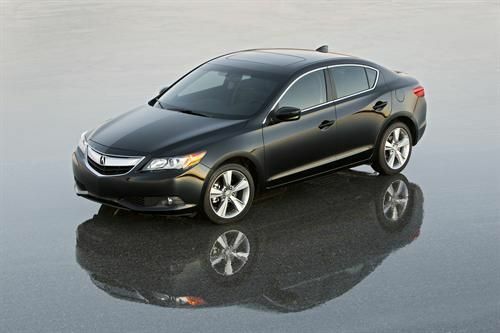 Last year, Consumer Reports was very harsh with the sport sedan, calling the 2013 Acura ILX a "tarted up Civic." For the 2014 model year, Honda's luxury arm took notice and made some big changes to the ILX's offerings after last year's complete redesign. The new 2014 ILX just appeared in showrooms this week and has standard 17-inch alloy wheels, new leather seating surfaces and leatherette door liners, an eight-way power driver's seat, heated front seats, and a multi-angle rearview camera. All standard. And that's just for starters. Standard audio upgrades include a subwoofer, an Active Noise Cancellation system, and more. All at an MSRP starting at $26,900. The 2014 Acura ILX has two powertrain options. A 2.0-liter inline four-cylinder engine producing 150 horsepower is standard as is the five-speed Sequential SportShift automatic transmission to give an EPA rating of 24/35/28 mpg (city/highway/combined). This can be upgraded to a six-speed manual transmission and 2.4-liter four-cylinder which generates 201 horsepower (EPA 22/31/25 mpg). The ILX Hybrid will release later in the year. Also standard on the 2014 ILX is a keyless entry system, pushbutton start, Pandora® radio interface as well as SMS text messaging in the center console. These can all be upgraded through the Premium and Technology packages, of course. Pricing for the car begins, as stated, at $26,900. Upgrading to the Premium Package puts it at $29,200 while the Technology Package takes it to $31,600. The 6-speed manual option with the larger displacement engine and Premium Package is $29,200. All prices do not include destination and handling charges. The 2014 Acura ILX has received a Top Safety Pick rating from the IIHS. It is built at the company's Greenburg, Indiana plant.